Ghanaian hospitality is legendary, the Northern Region is no exception. And so you are welcome to enjoy the scenic natural features, exotic culture and the legacies of a history of the largest region in Ghana. Its geographical features are mostly are mostly low lying, except in the north eastern corner with the Gambaga escarpment and along the western corridor. The land is drained by the tributaries of the Volta Lake: Rivers Nasia, Daka, Oti, the Black and White Volta covering over a third of the whole land mass of 70,390km big enough to swallow up other regions like Volta, Ashanti, Western and Greater Accra put together; call it the mother of all Regions! The largest of Ghana's National Parks and situated in the heart of the Guinea savannah woodland ecosystem, it is home to 93 mammalian species, 33 reptiles nine amphibians and an estimated 300 birds species. The mammals include some 600 elephants, 2,000 roam antelopes, 3,000 hartebeests, 4,000 waterbucks, 5,000 buffalo and some 6,000 warthogs. 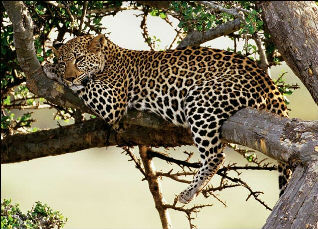 Uncounted lions, leopards, hyenas and various primates can also be seen in Mole. A total of 600km of game protection and viewing roads have been developed within the park. A basic 33-bed, no frills hotel facility, which overlooks an elephant bath, offers overnight accommodation and restaurant facilities. Additionally, composite facilities are available for visitors. A landing strip for small aircraft provides the option of air access to Mole. Nearby is a mysterious boulder that is the subject of a splendid local legend. 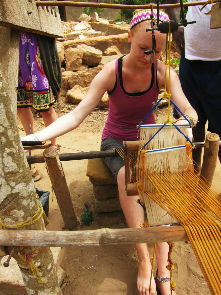 89km west of tamale, Daboya is the 16th century town from the Gonja Kingdom, and a famous source for hand-made textiles. 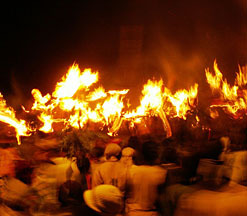 Among activities to mark the festival is the procession at night with torches into the bush or outskirts of towns and villages within Gonjaland. There are also Koran recitals to forecast the New Year. The significance of the festival is to commemorate the birthday of the Holy Prophet of Islam. Activities include prayers and fasting and procession of people on horseback, amidst drumming and dancing. 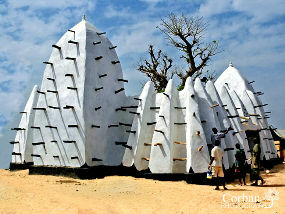 Although the Bugum Festival was also linked with Islam, it has become a major event on the traditional calendar too. It commemorates the flight of Naiyul-Lah Mohammed from Mecca into exile in Medina in AD658. The festival is celebrated in Dagbon, Gonja, Mamprusi and Nanumba. The events begin with processions from neighbouring villages. By nightfall, all the villagers converge at the Chief's palace with lighted torches. Following special invocations by the Chief, the ceremonial illuminate the streets. Festive drumming and dancing continue until the early hours of the morning. 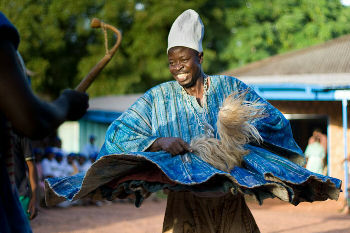 The Kpini Chugu is observed in the Dagbon, Mamprugu and Nanung Traditional Areas as a minor festival. These areas are made up of Dagombas, Mamprusis, Nanumbas, Kokombas abd Basaris. There is no general celebration. It is observed as a harvest offering to the gods.